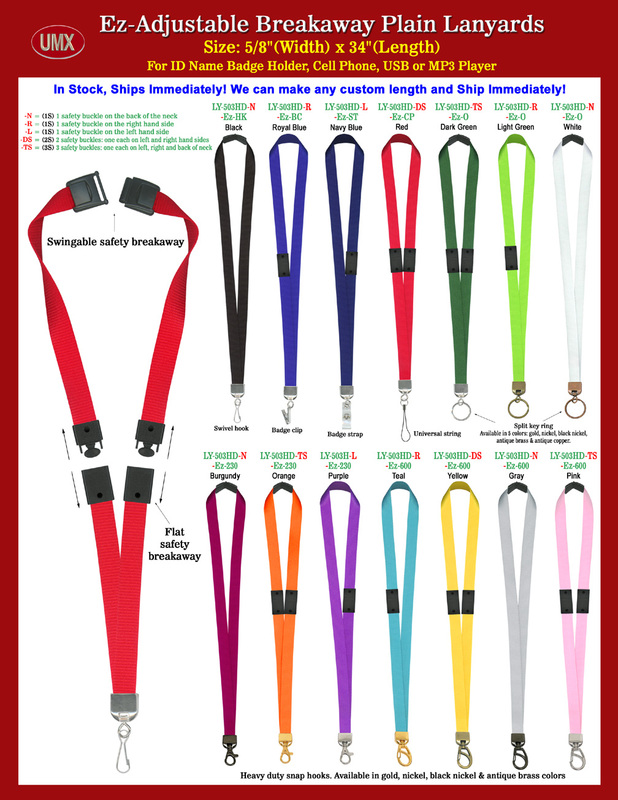 The great designed plain color safety breakaway ID holder neck lanyards come with 14 colors available. Not only for your neck ware ID card or name badge, the easy adjustable safety ID holder neck lanyards can come with 1, 2 or 3 breakaway safety buckle to give you extra protection. You can order any length of easy adjustable safety neck lanyards with 5 standard hardware attachments, all at the same low price. A variety of cell phone hardware attachments or Deluxe Ez-Adjustable hardware attachments are available for your different applications. We will make the custom length and custom combination of hardware attachments for you and ship your custom order right away! 4. Standard Colors of Webbing/Straps: 14 Colors: Black, royal blue, red, navy blue, white, yellow, orange, grey, burgundy, pink, dark green, light green, purple and teal colors.. Optional: Any Pantone PMS colors with a minimum order of 1000 pieces or more. Your pick of 1, 2 or 3 safety breakaway buckles. 7. Way of Lanyard Colored: Dyed. You are viewing Lanyards > Ez-Adjustable Plain and Pattern Printed Neck Wear > 14 Colors of Multiple Safety Breakaway Plain ID Holder Neck Lanyards With Flexible Length.